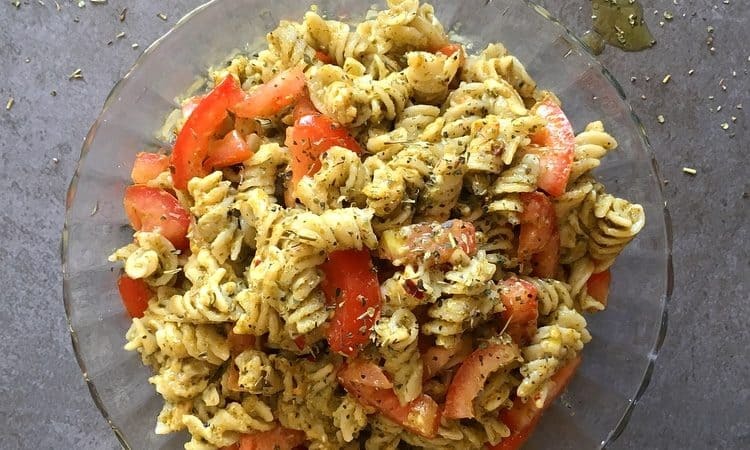 Pesto Pasta – Simply Delicious! Hello my lovely friends! Hope you are all doing great on this beautiful day! There are still days in Chicago that feel like summer; such as today! It’s quite beautiful and sunny out which inspired me to make a light pasta dish for dinner today. My husband and I haven’t had much pasta in our diet in the last 2 months; so this is a treat. As you all know from previous posts; we both have a love for pesto. Pesto is primarily a sauce made out of basil, garlic, olive oil, pine nuts, and cheese. 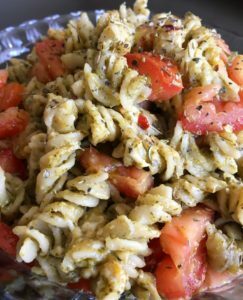 I use a store bought pesto sauce for this recipe just because I had it on hand; but to make your own is quite easy if all the ingredients are available to you. I also use gluten free brown rice & quinoa Fusilli pasta rather than regular or whole wheat. It has a slightly different texture and overall is better for you! First you want to fill half your pot with water and place on stove over medium heat till water is boiling. I always add a drizzle of olive oil and salt to my boiling pasta water. Once water is boiling; pour in all your pasta and stir. Cover and let it cook for 5-10 minutes. Once pasta is cooked; drain the pasta from its water. You will know the pasta is cooked when it is easy to cut through and isn’t gummy but still has a bite to it. Now with your drained pasta; add the pesto sauce, olive oil, cheeses, red pepper flakes, garlic powder, and Italian seasoning. Stir this all together for 2 minutes on low heat before adding your fresh tomatoes. Stir another 2 minutes till cheese is melted.